The Parish Council owns the Village Hall Car Park and the car park at Little Paxton Lawn Cemetery. 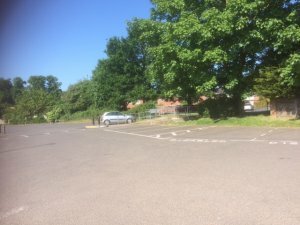 There are 31 marked parking spaces in the village hall car park which serves the Village Hall, Doctors Surgery, Scout Hut, Children's Play Park & QEII Playing Field. There are 4 car unmarked parking spaces in the Little Paxton Lawn Cemetery. The overspill car park has approx. 12 unmarked spaces for vehicles and is open for funeral access only. There are no charges for Parish Council parking spaces.